Ruth Eileen (Lambrecht) Young was born December 28, 1946, to Robert Otto and Phyllis Mae (Carr) Lambrecht in Sioux City, Iowa. She was raised in Dakota City, Nebraska and graduated from South Sioux City High School in 1964. Following her graduation, she worked for the railroad. On September 23, 1972, Ruth married David Young in Sioux City, Iowa. The couple moved to Denison, Iowa. Ruth continued to work for the railroad until her retirement. The couple started dealing in antiques and owned a few rental properties in Denison; including the Montgomery Wards building. In 2006, the couple moved to Pineville, Missouri and they purchased the Kozy Kampground; operating this for 11 years. Dave died in August of 2017, and Ruth returned to Denison in 2018. Ruth loved horses and was an avid horsewoman. She was a member of the Dixon Wranglers Horse Club in Dakota City and raised registered quarter horses. She also raised peacocks, enjoyed gardening, photography and bird watching. She also enjoyed fishing, traveling, and her yearly visits from her nephew Ryan Young from Las Vegas. Ruth also enjoyed her sister trips. 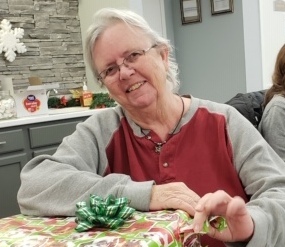 Ruth died on Friday, March 29, 2019, at the Crawford County Memorial Hospital at the age of seventy two years, three months, and one day. Ruth was preceded in death by her parents and husband, Dave Young. She is survived by her daughter, Michele (Kevin Stover) Kinnersley of Buck Grove, Iowa; two grandsons, Zachery Kinnersley of Sioux City, Iowa, Cole (Abby Zahnley) Kinnersley of Ida Grove, Iowa; great grandson, Parker; three sisters, Roberta (James) Gallup of Navarre, Florida, Susan (Gloria Cortez) Lambrecht of Smithville, Missouri, Patricia (Logan) Goodon of Tampa, Florida; brother, David (Cheryl) Lambrecht of Sioux City, Iowa and many other relatives and friends.